Maple rosemary pork tenderloin is incredibly easy, looks impressive, and is so delicious and tender. Easy recipes are my salvation, especially when the dish can be prepped ahead of time. Inspired by my recent purchase of real maple syrup for my maple thyme roasted carrots, I had to find more uses for this wonderful ingredient besides pancakes and the like. The maple rosemary marinade is four simple ingredients that sing fabulously together. I made this recipe twice, both times using Hormel ‘Original’ Pork Tenderloin- mainly because it was on sale at Publix. Turns out the ‘original’ means it is marinated already in basic brine, which explains why my recipe needed no salt whatsoever. If you are going to recreate this recipe I would suggest buying the same pork tenderloin which I’m sure is available all over, or place your pork tenderloin in a brine for a few hours before removing and placing in the marinade. The maple rosemary pork tenderloin was fabulously flavorful, tender, and the marinade made a great rich sauce. The sweetness of the maple was subtle and became savory with the stone ground Dijon mustard, fresh rosemary, and cooking white wine. Make this recipe for family, friends, or for a memorable dinner party. Remove the pork from the packaging, whisk the ingredients together, and pour the maple rosemary marinade over the pork. Place in a sealed bag or air-tight container. Marinade overnight or for at least 6-8 hours. Preheat oven to 400F. Heat the olive oil on medium to high heat in a pan or in a skillet with grill ridges. Sear on all sides for 5 minutes. Place on a baking sheet and roast in the oven for 12-15 minutes. Err on the side of 12 minutes if you prefer a more medium to rare pork, and 15 minutes for a solid medium. Meanwhile deglaze the pan used to sear the pork tenderloin with the remaining marinade. Allow the marinade to cook on low, bubble, and thicken for 5 more minutes. Remove from heat and pour the marinade into a gravy boat or sauce dish. Remove the maple rosemary pork tenderloin from the oven, allow it to sit for 2-3 minutes, slice, and top with a few spoonfuls of the sauce. Serve with green bean potato salad in bacon vinaigrette or with one of your favorite sides. This recipe for maple rosemary pork tenderloin is pretty amazing, and I’m sure you’ll agree so bon appétit friends! Healthy baked meatballs with spinach is an easy semi-homemade dinner that can be modified to feed 2 to 10. Dinner can be so daunting after a long day of work, but oh so rewarding when compared to the alternative. I am all about saving time in the kitchen, so I don’t mind cutting corners here and there. I have a lot going on with school, work, and blogging- so while making my own sauce and pasta would be swell- it ain’t happening right now. This recipe is for freshly made meatballs- healthily baked, mixed with an entire bag of fresh chopped spinach, and a store-bought light alfredo sauce with some added seasoning. I think the fresh bread crumbs are an absolute must here. I happened to have a two-day old egg knot roll from Publix that I tossed in the food processor . Really any bread will do- even regular whole wheat sandwich bread. The fresh spinach adds healthy antioxidants and that bright green which pops out on the plate. I baked the healthy meatballs till they were just cooked- you don’t want to overdo it since they’ll bake again with the pasta. Regular store-bought light alfredo sauce is given a little love with dried Italian seasoning and some nutmeg. I used part-skim mozzarella on top and baked the meatballs and spinach topped with cheese to a delicious golden brown. I think this would also taste great tossed together and sprinkled with parmesan reggiano cheese for a nice bite. Bring dinner back! Preheat your oven to 400F. Put the beef and pork in a large stainless steel bowl. In a food processor, place torn day old or stale bread into the processor first. If you pulsed the onion and garlic first, the container would be wet and the bread crumbs would stick, so logically- bread first! Place the bread crumbs in the bowl with the meat. Chop onion and garlic in the Cuisinart Food Processor . Add chopped parsley, oregano, red pepper flakes, pepper, salt, and the egg. Mix ingredients and form into meatballs of your size preference; place on parchment paper. Bake for 20 minutes. Boil well-salted water for pasta with a splash of olive oil. Place entire bag of fresh spinach in a colander . When the water is about to boil place the colander of spinach in the hot water and stir lightly till spinach is blanched. I’m all about saving time, and flash cooking the spinach in the colander is brilliant because then you don’t have to fish the spinach out of the water! Press a large wooden spoon against the spinach to remove excess water. Set aside till cool and finely chop, draining off any excess water. Put pasta in the same boiling water with the same wooden spoon across the top vertically (I swear this prevents the water from boiling over!!). Boil pasta as directed; drain in colander. Put pasta, chopped spinach, sauce, and meatballs in the large pot and mix. Pour into cast iron skillet and top with cheese. Bake at 400F for 10-15 minutes or until cheese is bubbly and golden; garnish the baked meatballs with chopped basil and enjoy! Fresh pizza dough, colorful healthy toppings, and bubbling melted mozzarella cheese all work to create a tasty semi-homemade pizza for two or a crowd. In order to maintain my sanity with school and work full-time, I like to make semi-homemade recipes that are good for you, taste great, and above all simple. This recipe for healthy garden pizza is an easy and quick recipe that is worth the little extra step here and there. My local grocery store, Publix, sells fresh pizza dough made daily in their bakery. These delicious balls of dough allow you to still get that quality homemade taste that is lacking in the canned variety, without going through the effort of making your own dough on a busy weeknight. I couldn’t find my rolling pin, so I hand-stretched and tossed the pizza dough like those guys you watch at an Italian restaurant- minus the finesse. Lightly sprinkle flour on the surface you are using to work the dough into your desired shape. Before I laid my dough on the baking sheet I added a scant amount of cornmeal for crunch and to prevent sticking to the aluminum foil (I ran out of parchment paper). I let the dough for my healthy garden pizza rest under a damp paper towel while I prepared the toppings for assembly and preheated the oven. I happened to have onions, black olives, steamed broccoli, and hot Italian turkey sausage on hand, but these easy homemade pizzas would go great with any toppings of your choice. I crumbled the contents of one hot Italian turkey sausage link and cooked them through, chopped my onion, and halved the black olives. Instead of a rich tomato sauce, I opted for a very thin coating of light creamy alfredo on top of the well-seasoned dough. The easy pizza was lightly sauced, topped with veggies, sausage and cheese, and small little dollops of creamy ricotta throughout for richness before being popped into the oven. The pizza was hot and delicious and tasted healthy. Not like a heavy delivery pizza that weighs you down. The abundance of fresh veggies and light sauce helped keep the flavors light and refreshing. This garden pizza is just one of many varieties to enjoy. The best thing about this pizza is the savory seasoning on the dough and its chewy, light texture. Next time I’ll add lots of red pepper flakes. Take back dinner friends, and cook at home! Preheat oven to 350. 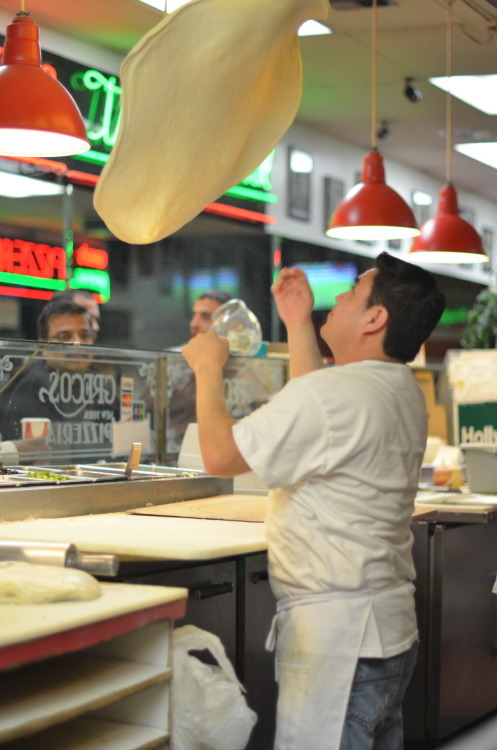 Roll out pizza dough or hand-toss and stretch dough to your desired shape. Make sure your surface is clean, sprinkle with flour if needed. Scatter cornmeal on baking sheet to prevent sticking and add crunch. Lay pizza dough flat and cover with damp paper towel. Crumble and cook sausage till cooked through, dice onion and halve black olives. Lightly brush dough with olive oil and sprinkle with Italian herbs, salt, and pepper. Thinly spread alfredo sauce, add toppings, cheese, and a little more toppings. Bake at 350F for 30 minutes or until crust and cheese are golden and browning.